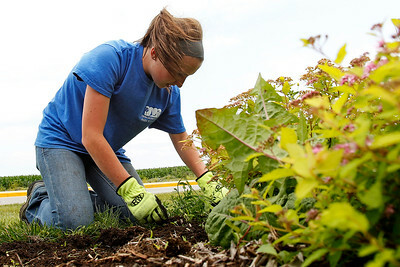 Matthew Apgar - mapgar@shawmedia.com Crystal Lakes Parks District employee Morgan Szmutko of Crystal Lake, 19, cleans up the landscaping around the sign at The Raquet Club on Tuesday, July 7, 2014 in Crystal Lake. Matthew Apgar - mapgar@shawmedia.com Crystal Lakes Parks District employees Kelsey Seegers, left, and Kevin Holder, both 19 and from Crystal Lake, clean up the landscaping around the sign at The Raquet Club on Tuesday, July 7, 2014 in Crystal Lake. 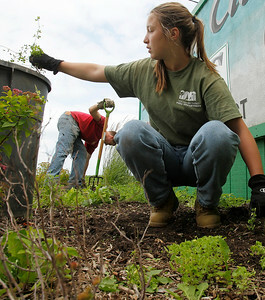 Matthew Apgar - mapgar@shawmedia.com Crystal Lakes Parks District employees Kelsey Seegers, front, and Kevin Holder, both 19 and from Crystal Lake, clean up the landscaping around the sign at The Raquet Club on Tuesday, July 7, 2014 in Crystal Lake. 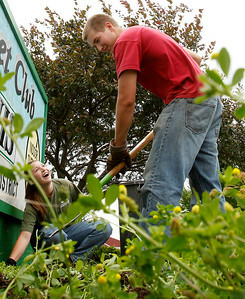 Crystal Lakes Parks District employees Kelsey Seegers, front, and Kevin Holder, both 19 and from Crystal Lake, clean up the landscaping around the sign at The Raquet Club on Tuesday, July 7, 2014 in Crystal Lake.